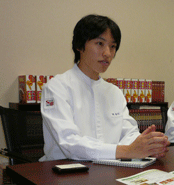 Company: S&B Sankyo Foods Co., Ltd.
S&B Sankyo is located in Yaizu City, Shizuoka Prefecture, which borders Suruga Bay. S&B Sankyo, a subsidiary of S&B foods, manufactures and sells retort pouch and canned foods such as curry, a Japanese favorite. Today we spoke with Mr. Furukawa, chief of production engineering who is in charge of manufacturing equipment maintenance and repair. Furukawa: "To help ensure product quality, we need to record and store data such as time and temperature in the sterilization tanks." 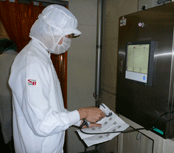 During their retort and canned food sterilization process, they use the GX20 Paperless Recorder to monitor and record sterilization tank temperature and pressure. Furukawa: "We used to use chart recorders. The recorded data has to be stored for three years after product shipment, so we had a huge amount of paper. When searching for historical data, it was hard to read because the paper started to deteriorate, and it was very difficult to find specific intervals of data in the vast mountain of paper. We also had to deal with recording errors due to paper jams and ink running out." When it came time to switch from chart recorders to paperless recorders, a technician tried out demo models from several different manufacturers and made a choice based on usability, functionality, and ease of transitioning from their chart recorders. Furukawa: "We chose a model based on the ease of operation, the channel group setting function, display screen customization, and other features." S&B likes the fact that the GX20 can display data in predetermined groups because this allows them to view discreet temperatures and pressures in each individual sterilization tank. They can split the display into several sections and assign one of many possible screens to each section, including trend, numeric, bar graph, message/alarm, and memory summary. The engineers also use a barcode reader with a RS-232C connection for entering messages upon recording start and other stages. Furukawa: "Another big advantage is that we can use the bar code reader to easily write preset messages. This really made our jobs easier." The GX20 supports RS-232C bar code readers, and has a USB option for connecting a keyboard or mouse. You can also write free hand messages with a stylus or on-screen keys, or write messages that are registered ahead of time on the GX20 main unit. Furukawa: "After sterilization, recorded data is automatically sent via FTP to a hard disk over the network. It's all solid state, so the data storage is highly reliable. Switching to paperless means no more recording problems; it's a huge help to know that our data is recorded and stored safely. Plus it's very convenient because we can use the dedicated software to browse the history and search for specific intervals of data. Also, we can view data on a web browser in real time, so if something goes wrong in the factory we can get the data and do the analysis right there in the office. We can even use this during meetings to view data in real time." The GX20 lets you view its screens from a web browser in real time for smooth remote monitoring. Furukawa: "The GX comes with several functions such as one that sends an email when an alarm occurs, so I think we are going to be able to maintain security while exploring additional applications that make use of its networking and paperless advantages." The GX20 has a variety of convenient networking functions such as FTP and email that allow users to create recording environments that are customized to their needs. Furukawa: "We can rely on the product, knowing our data is secure." S&B Sankyo Foods Co., Ltd.